This unique event is rowed over a course of seven miles between the Palaces of Greenwich and Westminster. Each barge is manned under oars by crews of Freemen and Apprentices of the Company of Watermen and Lightermen. The event is designed to showcase the skills of Watermen and Lightermen in navigating under oars, using only their own strength, experience and the tide to propel their craft, which can weigh up to 30 tonnes. No more than three crew members can row at any time using the 20ft oars, known as "sweeps". Two of the rowers power the craft whilst the third uses a sweep at the stern to steer the barge with the tide. As a further test of the crews' navigational skills each barge must collect at least one pennant from barges moored along the course . The crews can also compete for the optional Almshouse Benevolent Fund Trophy, by collecting two pennants, or the Harry Hayward Trophy, for which three pennants must be collected from three moored barges along the course and the barge must use Number 2 Arch of Southwark Bridge. Prizes are awarded to the overall winner, two class winners and for the two special optional race sections described above. There are also categories for the best dressed crew - each event has a theme, and the best painted barge. 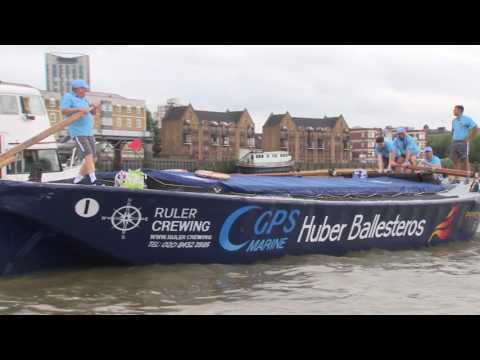 The event is very popular for spectators, who line the route, watch from bridges and other vantage points along the way or watch from one of the many Thames pleasure craft that follow the course. For more information about the Thames Barge Driving Trust and other barge driving events please click here or alternatively visit the Thames Barge Driving website by clicking here (opens in new window). Click here to see a film about the 2017 race.